Let’s not kid ourselves, the Mazda MX-5 is not and never was a fast car. Quick? Yes. Fun to drive? Absolutely. But certainly not fast. This enlarged go kart of a car consistently delivered smiles to owners everywhere over the past 16 years of production, due to its excellent handling and incredibly low weight. 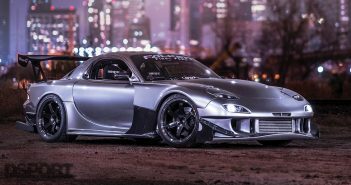 The current ND model introduces the lightest Miata since the first generation, however, its 2.0-liter SKYACTIV-G power plant produces less horsepower and torque than its most recent predecessor. For this Test & Tune, we started with the basics of intake and exhaust in the search for more power and improved drivability for the 2016 Mazda MX-5. The 2016 Mazda MX-5 proved itself the fastest of all four generations of the Miata lineage, yet according to the factory ratings, it produces just 155 HP and 148 lb-ft torque at the crank. Although this ND generation Miata isn’t the most powerful of all four iterations, it still beats its siblings to 60 MPH. Its low weight, effective horsepower and torque curves, and track-favoring gearing with sixth gear running a 1:1 ratio contribute to the car’s quickness. This adds up to a 0-60 time of just under six seconds, a respectable number for the MX-5’s price and vehicle class. 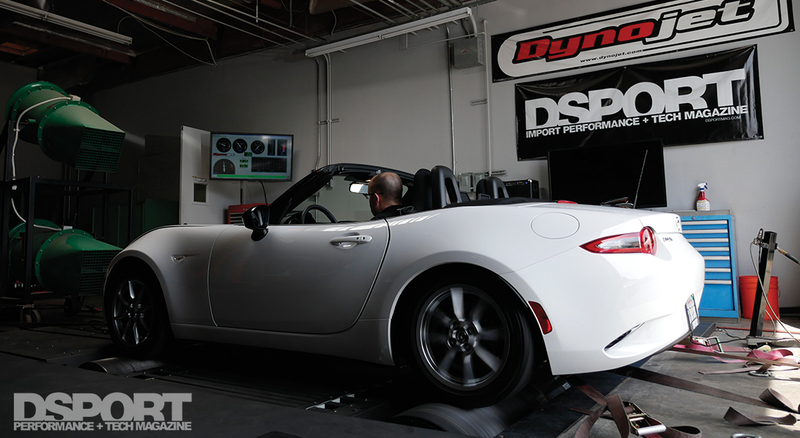 To set a starting baseline for power, we strapped the MX-5 onto DSPORT’s Dynojet 424xLC2 Linx Dynamometer to measure an output of 135.51 WHP and 134.16 lb-ft of torque at the rear wheels. The torque came in early, reaching its peak output at 3,700 RPM. Although the car’s torque shows a healthy overall curve, we found a slight dip between 3,800 RPM and 4,400 RPM that we’d have to address. The horsepower curve, however, sailed smooth and constant up to its peak at 6,100 RPM with very little drop on its way to the rev limiter. However, with 2.0-liters of engine displacement at the car’s disposable, we’re convinced that the ND could and should be producing more power. To kick off this Test & Tune, we installed Good-Win Racing’s RoadsterSport Race muffler. 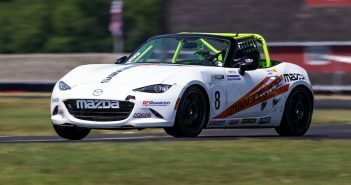 Good-Win Racing holds a strong reputation with the Mazda tuning community, developing performance components in power and handling for some of Mazda’s most popular vehicles. The RoadsterSport Race muffler would fill in for the MX-5’s bulky and large factory equipment, improving airflow and reducing weight. The factory muffler design for the 2016 MX-5 is inefficient to say the least. Brian Goodwin of Good-Win Racing shared with us his findings after cutting out the factory muffler’s shell. The results showed that exhaust gasses enter large open chambers inside the muffler, with no direct path leading to the two 1.25-inch pipes and resonators that allow the gasses to exit. The compact and lightweight RoadsterSport Race muffler is one of the simplest upgrades to raise power and produce a healthy exhaust tone for the MX-5. 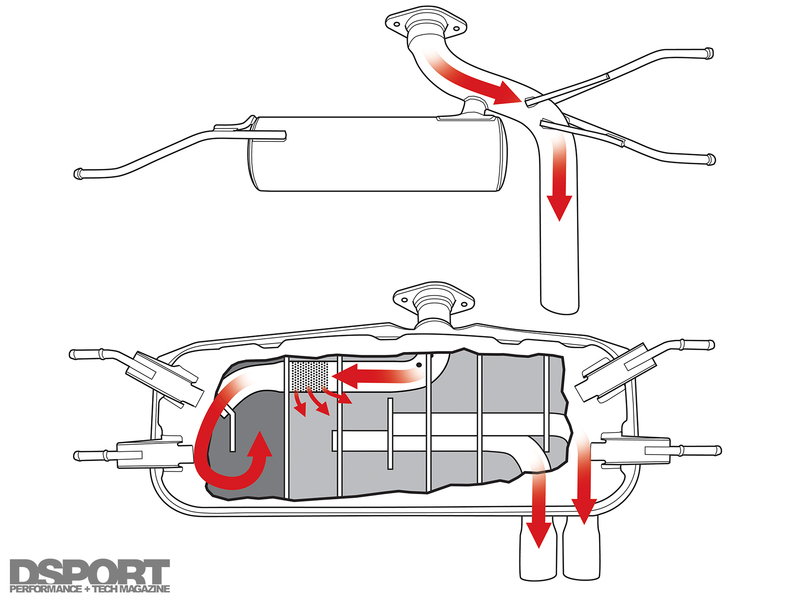 Good-Win’s RoadsterSport Race muffler essentially acts as a straight pipe for optimal power. The resonator lets exhaust flow past undisturbed, only catching and cutting down specific sound frequencies. The MX-5’s original muffler utilizes multiple chambers to reduce noise. With no direct path for gases to travel, sound is deadened significantly at the sacrifice of power. The RoadsterSport Race muffler offers an uninterrupted path for spent gasses to exit the exhaust plumbing, freeing up additional power. In order to accomplish this, Good-Win Racing purposed this hardware with a unique design for sound deadening that utilizes a Helmholtz chamber. This chamber branches off of the main exhaust piping, catching undesirable sound frequencies without interrupting exhaust flow. This design helps save on weight immensely, totaling just 11 lbs, nearly halving the weight of the factory 20.5 lb muffler. With the MX-5 back on the dyno, and Bill Knose from Delicious Tuning making adjustments via EcuTek Pro ECU programming so ware, the RoadsterSport Race muffler produced an 8.4 horsepower and 2.51 lb-ft torque increase over the factory setup. This amounts to a 5.8-percent increase in horsepower and 1.8-percent increase in torque. The torque dip was still present in the same RPM range, but the horsepower curve realized a great improvement with little to no drop after reaching its peak. Additional Notes: The MX-5 muffler utilizes two 14mm bolts and four exhaust hangers. The RoadsterSport Race muffler reuses these bolts, and three of the four original hangers, so hang onto all the pieces you remove. 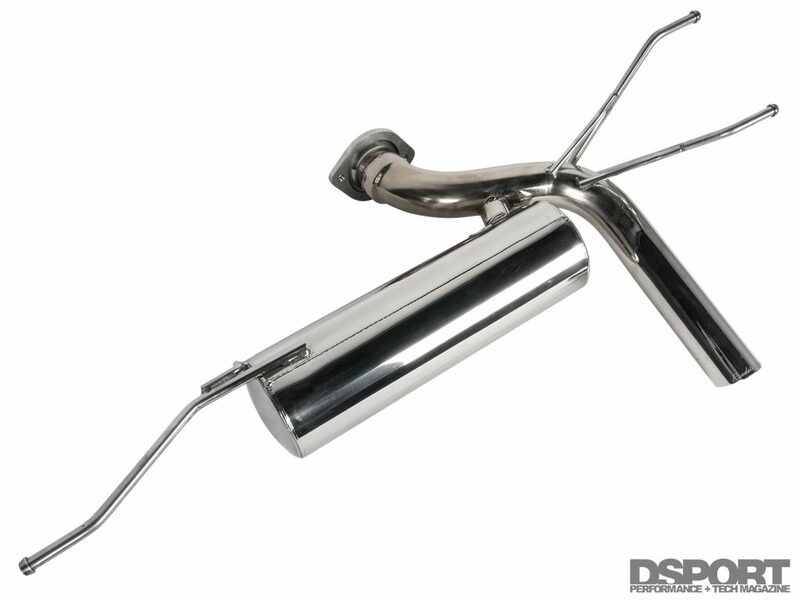 A bit of silicone spray and exhaust removal pliers will go a long way in decreasing both the time and effort required to remove the factory muffler and install the RoadsterSport replacement. 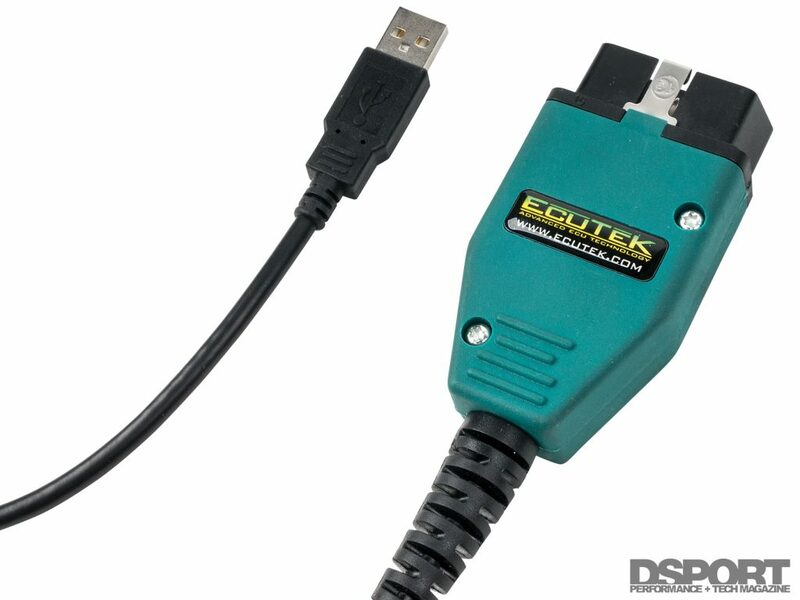 EcuTek’s Pro ECU programming software and OBDII interface enabled us to extract the most power possible out of the MX-5. The latest software includes features like launch control, flat foot shifting, auto blipping and per gear rev limits. On the intake side, a CorkSport Cold Air Intake System would breathe life into the SKYACTIV-G engine. 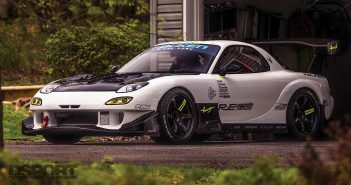 Non-Mazda owners may not be as familiar with the CorkSport name, as this company also specializes in Mazda performance in both street and racing applications. 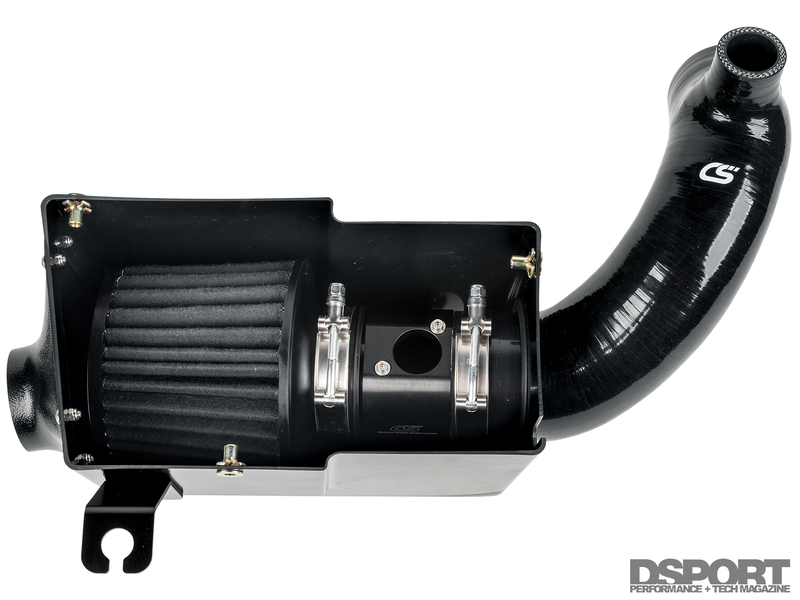 This Cold Air Intake replaces the factory airbox and panel filter setup with its design geared toward cooler, faster flowing air. 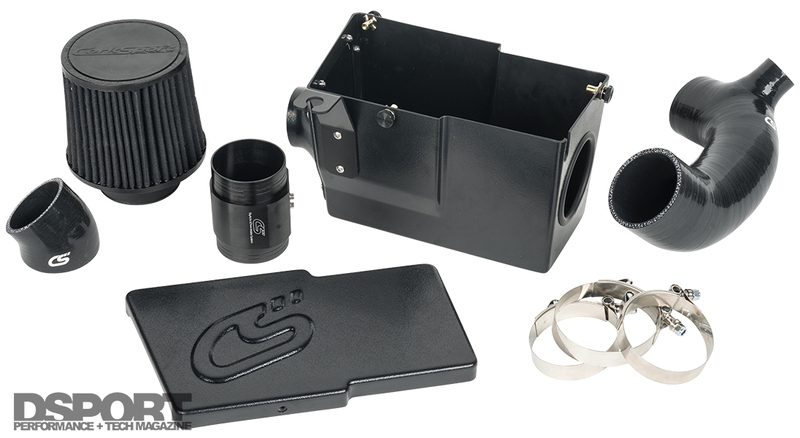 The intake utilizes an AEM Induction dryflow filter with an internal velocity stack design, contained inside CorkSport’s CAD- designed cold air box. A billet aluminum MAF housing leads to another velocity stack expansion as air enters the reinforced silicone piping to the throttle body. This smooths out the path for incoming air to travel through, cutting out the inefficiencies that resulted from the factory intake. With the new muffler and intake in place, we spun the rollers again to discover where the MX-5’s performance lay. The dryflow air filter, velocity stack designs and smoothed out silicone piping paid off, helping the car deliver an additional 1.51 horsepower and 2.69 lb-ft torque. 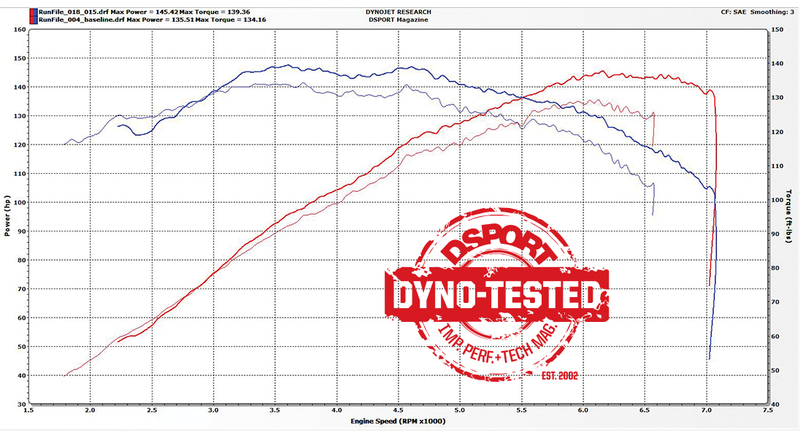 The peak numbers may appear minimal, however, the CorkSport intake improved the shape of the power curves significantly. The torque dip around 4,000 RPM nearly disappeared completely, while the horsepower curve showed a constant and steady gain throughout the majority of the RPM range. Since the SKYACTIV-G engine continued producing power up to the 6,800 RPM rev limit, Knose raised the limiter to 7,100 RPM. This would allow the engine to stay in the powerband for even longer when accelerating into high RPMs, and would bring the revs closer to peak power after each upshift. Additional Notes: Like the muffler, CorkSport’s Cold Air Intake System reuses hardware from the factory equipment. Most of the factory intake is made up of plastic parts, so take care during the removal. The breather that comes off the throttle body rubber coupler is especially fragile, as the tabs on this piece will easily fold and break. When installing the CorkSport hardware, there will be very little clearance between the silicone piping to the throttle body and the battery, running the risk of rubbing and eventual wear. Loosening the battery tie-down and shifting the battery as far away as possible will provide the space necessary to avoid any problems. The new components added nothing but positive effects for regular street driving. The Good-Win Racing RoadsterSport Race muffler is the manufacturer’s loudest muffler option, however, most enthusiasts likely would appreciate the sound and volume that the muffler delivered. The Helmholtz chamber design cut out the raspy high tones that plagues many four cylinders with modified exhausts, producing a deeper growl out of the tailpipe. This muffler, combined with CorkSport’s Cold Air Intake System and Delicious Tuning’s custom mappings, ultimately delivered a smoother and livelier driving MX-5 on the street. 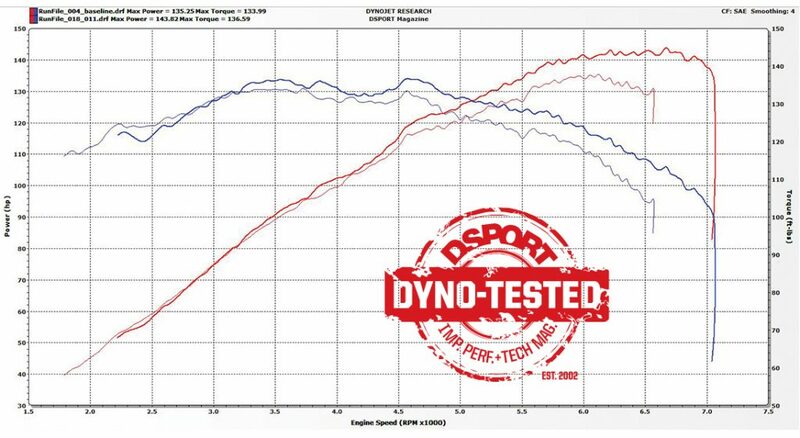 The reduced dip in the torque band made the car more satisfying to drive around in the city, while the horsepower increase and 7,100 RPM rev limit made for extra fun for the car to stretch its legs. Although the numbers may look small on paper, the power enhancements and improvements to the power curves greatly benefited this MX-5. 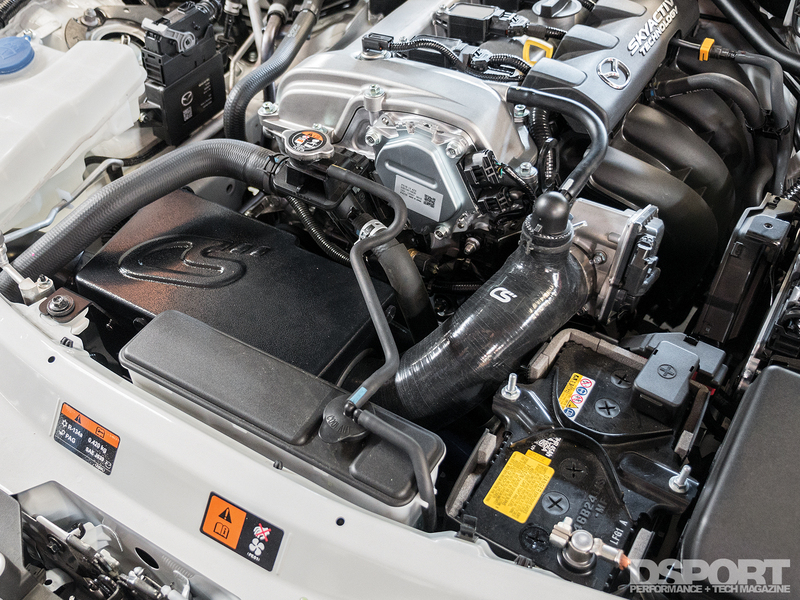 However, there’s still plenty of room to extract more power out of the car’s 2.0-liter SKYACTIV-G engine. It’s a relatively new platform for manufacturers to develop and test with, so only time will tell what the ND MX-5 is really capable of. Next, we’ll find out how the intake and muffler, combined with updates to the chassis and handling, benefit the car on the racetrack.